The customer sent this unit in for ECU Testing + Reporting because the vehicle would not start but he was not sure whether fault was being caused by the ECU or not. We tested the unit and found the ECU was not sending an output signal for spark, therefore stopping the vehicle from starting. We informed the customer there was no spark output from the ECU and got the go ahead to repair the unit. We repaired this ECU and re-tested to confirm it was fully functional before sending it back to the customer. The BMW E30 / E34 325i is fitted with a Bosch DME M1.1 Engine ECU and we’re able to fully test, repair + rebuild these units. They commonly suffer with water damage and we have a very high success rate in repairing these units. 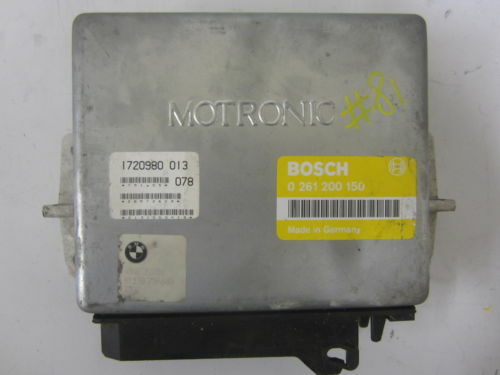 If you have a BMW with a faulty engine ECU then get in touch today. You can email us, drop in or simply call us on 0208 853 5000. This entry was posted in Repaired ECU's and tagged BMW 325i ECU Problems, BMW E30 ECU Repairs, BMW E34 ECU Faults by smartAjaz. Bookmark the permalink.